Inside Kettle Cleaner. 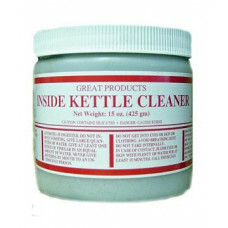 Formulated to clean the inside of your popcorn kettle. Heavy-duty cleaning and degreasing of the interior kettle surface without damage or scratching. Regular use will extend the life of your kettle and provide more efficient operation. A clean kettle makes for better tasting popcorn. Avoid contact with skin.